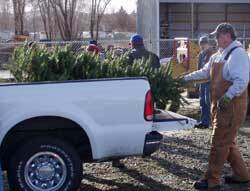 Each year Camp Prime Time's Christmas Tree Recycling Event involves nearly 800 volunteer hours, many cups of coffee, lots of laughter, and hours in the fresh Yakima winter air. Funds raised benefit the work of Camp Prime Time and is made possible by our fantastic volunteers and generous donors from the Yakima Valley! 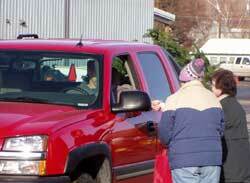 People are greeted at the drop off sites by volunteers carrying red donation bags. They ask for donations to benefit Camp Prime Time. 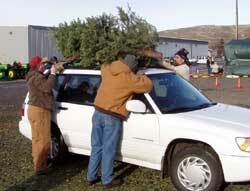 People drive right into the donation site with their Christmas tree tied to the top of their car/van or piled in the back of a truck. 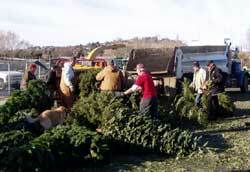 Volunteers remove the ties and unload the tree from the vehicle. 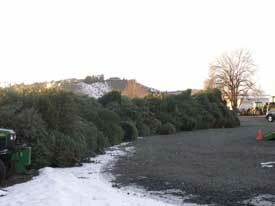 The trees that have been accumulating over the two week drop-off period are piled up at Barnett Implement. On the final weekend volunteers gather to feed the pile of trees into the wood chipper. 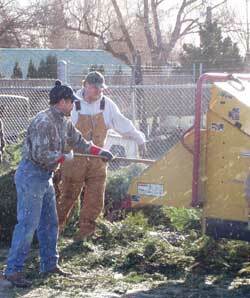 Chips fly furiously as volunteers feed the donated trees into the chipper. 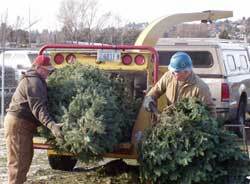 It's a mountain of trees we collect each year. Our thanks to the many volunteers who make this fundraising event such a success every year for Camp Prime Time. In particular, we'd like to thank Washington Tractor, and Barnett Implement & Colonial Lawn and Garden in previous years, for allowing their space to be invaded for two weeks. Thanks also goes to the many local businesses that demonstrated their support by partnering with us, lending us equipment and helping us to advertise. It all adds up to a very successful event both for Camp Prime Time and for the environment.